March 24, 2011 - James Anderson was fired from Ryanair back in 2009 for passing out union recruitment leaflet to a member of his cabin crew. Anderson was a captain with Ryanair since March 2001. Ryanair which is run by Michael O'Leary is an Irish low-cost airline with its head office at Dublin Airport, and with primary operational bases at Dublin Airport and London Stansted Airport. 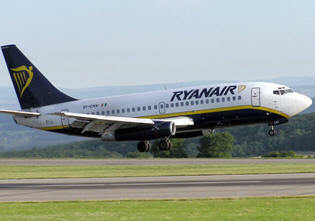 Ryanair operates over 250 Boeing 737-800 aircraft on over 1,100 routes across Europe and Morocco from 44 bases. The airline has been characterized by travelers as the worst airline to fly, infamous for its customer service, which some would characterize as minimalist and others have described as hell. Ryanair reported that company fired Anderson for gross misconduct. Among the reasons for his dismissal was his unacceptable behavior in distributing trade union literature and memberships forms to cabin crew during a flight, and when he should have been focusing all of his energies on flying the aircraft and the safety of Ryanair?s passengers, crew and aircraft. British Airways pilots union, British Airline Pilots' Association (BALPA) reported Anderson had given one of his cabin crew a union recruitment leaflet from Unite, the union which organizes flight attendants. Anderson and BALPA filed a claim with their Employment Tribunal. ?This case is just another PR stunt by BALPA, the British Airways pilots union, who frequently claim that Ryanair?s pilots have no free time when flying, yet now they believe that when the plane is on ?auto pilot?, it is acceptable for the Captain to be distributing union leaflets and membership forms to cabin crew,? said Stephen McNamara a spokesmen for Ryanair. ?It?s remarkable that Jim McAuslan, the foolish boss of British Airways pilot union BALPA is ?proud? to be supporting this pilot and thinks it is acceptable that pilots, when they should be flying the aircraft and focusing on safety, are instead distributing trade union leaflets and membership forms. We have no problem with pilots distributing leaflets on their own time, but not during a flight, when they should be attending to the aircraft, going through their check lists and prioritizing the safety of Ryanair?s aircraft, and not the membership of failed BA trade unions.? ?Ryanair looks forward to meeting and defeating these latest baseless claims by BALPA, who appear to think it is acceptable for highly paid pilots to be distributing trade union leaflets to cabin crew during a flight, when Ryanair believes they should be flying aircraft and attending to safety.? Jim McAuslan, General Secretary for BALPA said ?BALPA is proud to be supporting James Anderson's case, as the Union believes that he should never have been dismissed in these circumstances?. Ryanair is alleging that giving the leaflet to a member of cabin crew while the aircraft was in flight was unsafe. Although the aircraft was at cruising altitude, on automatic pilot, with a co- pilot at the controls and that in these circumstances pilots are free to eat, drink, go to the toilet, and talk to cabin crew. The case was to be heard on from Tuesday 22 to Friday March 25, however, BALPA was able to secured a settlement from Ryanair. ?The British Airline Pilots Association is delighted with the offer of settlement in this claim for unfair dismissal against Ryanair,? said Jim McAuslan, BALPA General Secretary. ?We regard this as a significant victory. As a professional association representing all commercial airline pilots BALPA is proud to support each and every member, whichever airline they fly for. The safety of the travelling public depends on the likes of Captain Anderson and that is a responsibility he is proud to shoulder. Captain Anderson, like all his professional colleagues, will not see that compromised?. Captain Anderson is now in a position to provide support for his family and the settlement of ?40,000 will contribute towards speech therapy sessions for his daughter who suffers from Downs Syndrome. This, in part, will make good the 2 year period in which Captain Anderson was not able to provide full support for his family as he would have wished. ?